Logic Pro X was released on July 16th, almost four years to the day after Logic Pro 9 — the longest that users have had to wait for a major new version in the product's 21-year history. Apple switched Logic Pro from boxed product to download nearly two years ago, so it's no surprise that Pro X is available only through the App Store. And whereas Logic Studio had previously sold for £399$499 and included additional applications such as Main Stage, Soundtrack Pro and WaveBurner, Apple unbundled Logic Studio when it moved to the App Store, making Logic Pro available for just £139.99$199 and Main Stage for £20.99$29.99, and discontinuing Soundtrack Pro and WaveBurner altogether. Moving Logic to the App Store has one big implication for existing users, which is more a limitation or policy of the App Store than a decision Apple have made for Logic Pro specifically: there is no upgrade pricing. If you previously bought Logic Pro 9, you'll pay the same price as those coming to Logic for the first time, although this isn't, perhaps, as unreasonable as you might first think. When Apple released Logic Pro 8 and 9 as part of Logic Studio, users of previous versions could upgrade for £159$199, which means that the upgrade price to X is, in effect, less than the same as you would have paid for an upgrade to 9. The initial Logic Pro download weighs in at a mere 650MB, but on first launching the program, you'll be asked to wait while Logic downloads a 2GB "essential collection of instruments and settings”. After this, you're free to use Logic, although there's nearly 35GB of further content waiting for you in the cloud if you desire. As the basic content downloads, two links to Logics Pro's Help system are displayed: one for newcomers, and one for existing users. Apple have decided to rename some of Logic's vernacular, so a look at the "New and changed terms in Logic Pro X” section of the latter will save some frustration. There is no longer an Arrange window — it's now called the Logic Pro main window — and the Arrange area itself is now the Tracks area. The Sample Editor is now the Audio File Editor, and the Transport bar has been assimilated into a new Control bar. Apple have also given Logic a dose of Ritalin, removing any occurrences of the prefix 'hyper' from the program. The Hyper Editor is now the Step Editor, and Hyper Draw (introduced in Logic 2.5) is now MIDI Draw. Humbug! Another change worth noting is that Logic Pro X, like Pro Tools 11, is a 64-bit-only application, and Apple have removed the 32-bit Audio Unit Bridge that allowed 32-bit plug-ins to run. This will obviously be something of a pain for those who have 32-bit plug-ins they still want to use, although I can see why Apple wanted to force everyone into the 64-bit realm: running 32-bit plug-ins via the Bridge never felt completely reliable. Using a host like Vienna Ensemble Pro alongside Logic might help mitigate some of the frustration. A comparison between the interfaces of Logic Pro 9 and X. I kept the default settings, except for making Logic Pro X's Inspector as small as possible, and showing Logic Pro 9's toolbar in Text Only mode. If you're used to previous versions of Logic, I think it's fair to say that you might be in for a bit of a shock the first time you see Logic Pro X's new user interface. It's certainly not 'GarageBand Pro', as many users feared, but Apple have clearly taken ideas from Logic Pro, GarageBand and Final Cut Pro X and fused them together to create a modern look. The result is incredibly dark, even compared with other music software, and a part of me misses the appearance of Logic 9, where function areas were light and contrasted well with the darker editing areas. Along with the palette change, Apple have also introduced arguably the most significant user-interface overhaul that the program has yet seen. Logic's previously sparse menu structure has been fleshed out to provide easier access to the program's many commands, and that's probably a good thing. The Track menu from the old Arrange window has been promoted to the main menu bar, and is joined by other menus, such as Navigate, Record, Mix and View. I was fairly well acquainted with Logic's earlier menu structures, but this is definitely an improvement. Before going any further, I should note that when you open Logic Pro X for the first time, you might not see all the commands you're expecting in the program. In what could be considered a slightly dubious move to make the program seem less overwhelming to newcomers, Apple have added an Advanced Tools mode that needs to be enabled to show features like the Event, Marker, Tempo and Signature Lists, or MIDI Draw and step input recording. There are also additional 'advanced' options for audio, surround, MIDI, control surfaces, score and advanced editing functionality. So the first thing you should do after loading Logic Pro X is to open the Advanced Preferences panel and make sure all of these options are enabled. The redesign sees the Transport bar relocated from the bottom of what was the Arrange window, and incorporated into a new Control bar at the top. The main element of the Control bar is the LCD (previously known as the Transport bar Display), which displays the current position in beats, along with the tempo and the key and time signatures. To seasoned Logic users, this may appear worryingly basic. However, the LCD offers a number of Display Modes (including Beats, Time and both together) and choosing Custom will cause the LCD to show the old Transport bar Display information. The Control bar also includes a few of the icons previously found on Logic 9's toolbar: specifically, those for toggling the Inspector's visibility, and opening the various list editors and browsers that appear on the right-hand side of the main window. Although it's possible to configure what controls appear on the Control bar and LCD (by right-clicking in an empty spot and clicking 'Customise Control Bar and Display…'), you'll notice that it's not possible to include any editing commands that could previously be attached to the toolbar. This is because the Control bar is not, in fact, meant to replace the toolbar, and Logic Pro X provides a separate toolbar that is summoned by toggling the Toolbar button on the Control bar. You can, again, customise the toolbar as before, and this process has been made easier: you simply toggle the commands you want, rather than having to drag and drop icons. The only slight omission is that it's no longer possible to have the toolbar buttons displayed as 'Text Only', which is a shame, considering the far-from-humble size of the icons! A number of subtle visual cues have been added to make the current state of Logic a little clearer. As with some hardware mixing consoles, the colour used to display text in the LCD now reflects certain transport states: blue, by default; red when recording, and yellow when a Track is soloed or Solo Mode is enabled. In fact, solo and mute states in general have been made slightly clearer, as Logic now greys out any Regions not eligible to play, and blinks the Mute button on all tracks not previously muted when one or more tracks are soloed. Should you need help about any aspect of the interface, a new Quick Help feature provides a brief snippet of information about whatever part of the user interface the mouse is hovering over. Quick Help is toggled via the Control bar and appears at the top of the main window's Inspector, and a nice touch is that if you need additional help about the feature currently being explained, you can simply press Command-/ to open Logic Pro's help system at the appropriate place. I did encounter a small anomaly, though: when you have another Logic window open on top of the main window, Quick Help still tracks the main window rather than the window that has focus. Even stranger, if you open an Environment window (yes, it's still there, although looking a little lost between the past and the present), the Quick Help Inspector section moves to the Environment window, but still shows help for the controls on the main window behind. In use, I was initially unsure whether I liked the redesign; but after the first day or so I realised it wasn't as radically different as it had first appeared. It's a bit like revisiting a house you lived in as a child that's been modernised and changed by the new owners: it's still basically the same house and you know where all the rooms are, but it's been redecorated and the kitchen has been made more accessible. My biggest complaint about the interface is that many elements have swollen in size to take up more screen real estate than seems necessary, leaving less room in which to work. The Control Bar icons are pretty substantial, and although you can opt to hide the Control bar completely, you'll probably need to learn a few key commands to navigate the program without it. The Inspector, which is slightly resizable, takes up more space than in Logic 9, as do the List editors, which are only resizable in the wrong direction. I used to really like having the Event List open on the side when I was working, but it now feels slightly indulgent on anything less than a 30-inch display! The most common resolution for MacBooks is 1440x900 (unless you scale up to non-Retina resolutions on a MacBook Pro with a Retina display), and Logic Pro X feels distinctly cramped in these dimensions, compared to previous versions. Making the user interface elements larger was apparently a deliberate move by Apple, partly to take advantage of newer display technologies, but also because some Logic 9 users found the interface elements too small. I suppose I should be grateful my eyesight isn't such that the tumescent new interface makes me happy, and, if nothing else, it certainly shows that you can't please all Logic users all the time. The Track List has also received a great deal of attention in Logic Pro X, and, before we go any further: yes, it's finally possible to select more than one track at a time. Hurrah! Selecting multiple tracks works much like selecting multiple items in the Finder: you can Command-click to individually select and deselect tracks, as well as selecting a track and then Shift-clicking another to select all those in between. The Track Header's controls are laid out slightly differently from before. Controls such as mute, solo and freeze are now displayed to the left of the header, and, if the header has sufficient height, the track name will be displayed above the controls. The track name itself is now set in a much larger font, which is definitely clearer than before, although, while it's still possible to reduce the track height to a fairly small dimension, track headers can't be made as small as in Logic 9. This may or may not be an issue, depending on the size of your typical Track List. A few pixels make all the difference. If the Track Header size becomes too small, the Track Volume control changes to a signal-present LED and the pan knob disappears. The colour bars are now an optional background behind the track number on the left-side of the header, and, perhaps most controversially, Logic's Track Level Meters have been replaced with GarageBand's integrated volume and level meter track control, which now appears on the right. In theory, the idea of having a combined volume and level meter control on a track isn't a completely terrible proposition. In practice, however, it is. The Track Header has to be quite a reasonable size (both in width and height) for the volume control to even be visible, making it useful for either very small projects, or very big Track Headers. Below a certain size, Logic will substitute the volume control with a small, circular, LED-like indicator that illuminates when signal is present. Logic's old level meters weren't particularly informative, but they were more informative than a blinking light. There must be a better alternative. Alongside the volume control is a pan knob, though again, this knob only appears if the Track Header is a fairly healthy size. A nice touch is that you can set it to control one of the eight available sends if you'd rather, though it would be nice if the number of the send appeared inside the knob, or something. As it is, you can only see to what send a knob is assigned by clicking on it. Tracks also get an on/off switch, so you can disable all processing overhead for a track by simply turning it off. I thought at first that the Hide Tracks functionality had disappeared, but it turns out that the Hide button only appears above the Track List after you hide your first track using a key or menu command. Would it really have hurt just to leave the Hide button there to begin with? 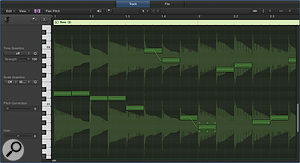 A common request among Logic users over the years has been for Cubase-style Folder tracks. Of course, Logic has had its own Folder tracks from the very first version, but these were intended for horizontal musical arrangements rather than vertical track organisation. In Logic Pro X, Apple have indeed added such a feature, in the form of Track Stacks, which allows you to place one or more sub-tracks inside a main track. Here you can see a Track Stack open (top) and closed. Notice how overlapping Regions become Stacked Regions. You create a Track Stack by selecting all of the tracks you would like to put into a Stack — this is where being able to select multiple tracks simultaneously comes in handy — and select Track / Create Track Stack. Two types are available: Folder and Summing. Folder Stacks are useful for purely organisational purposes, when you want to be able to group a number of tracks together and expand and collapse them as a 'folder' within the Track List. A Folder Stack's main track has mute and solo buttons, and, as you would expect, if you mute or solo a Folder Stack's main track, all the tracks within the stack are muted and soloed as well. The main track also has a volume control which trims the overall level of the sub-tracks, but does so without adjusting their volume settings. So if you have a sub-track playing at 0dB and you bring the main track down by -6dB, the sub-track's fader will show 0dB, but the audio will be heard at -6dB. This is useful for retaining relative mix levels within Stacks. The way in which Regions are handled for Track Stacks is actually quite interesting and pretty smart. When a Stack is collapsed, so long as there are no overlapping Regions, the individual Regions within the Stack can be edited as normal. However, when there are overlapping Regions, Logic will show Stack Regions that represent these overlapping Regions. These Stack Regions can be moved around, which causes the Regions within the sub-tracks to be moved accordingly, and, although you can't resize a Stack Region per se, you can stretch it out to loop the corresponding Regions. A nice visual cue with Track Stacks is that Logic adds a colour hint to the background of the main and sub-tracks in the Tracks area, making it easy to see where Track Stacks begin and end. The background colour used will be the colour assigned to the main track, although I did notice a small visual glitch. When you change the colour of the Track Stack track, the background in the Tracks area changes for all but the last track in the Stack. However, if you move the scroll bar, collapse and expand the Stack, or do anything that forces a redraw, the colour is changed to the correct one. Summing Stacks behave very similarly to Folder Stacks, but differ in one important way. With a Summing Stack, the main track behaves like an Aux Input track, and Logic automatically uses a new bus to route the output of the sub-tracks to the input of the main tracks. This opens up some interesting possibilities, because if the tracks within a Summing Stack are Instrument tracks, then, unlike with Folder Stacks, you can select the main track and treat it as if it was a stand-alone Instrument track triggering all the sub-tracks within. The only thing to watch out for is that if you create or record Regions on the main track of a Summing Stack, Logic will only show those Regions when you collapse the Stack, regardless of whether there are any Regions on the sub-tracks. Say you have no taste and you create a Summing Stack containing an Instrument track for piano and another for strings. You can now choose either the piano or the strings sub-track and record onto them individually as normal, or you could record a Region onto the main track that triggers both piano and strings together. If you look through the Library of new patches that come with Logic Pro X, you'll notice quite a few that adopt this technique. 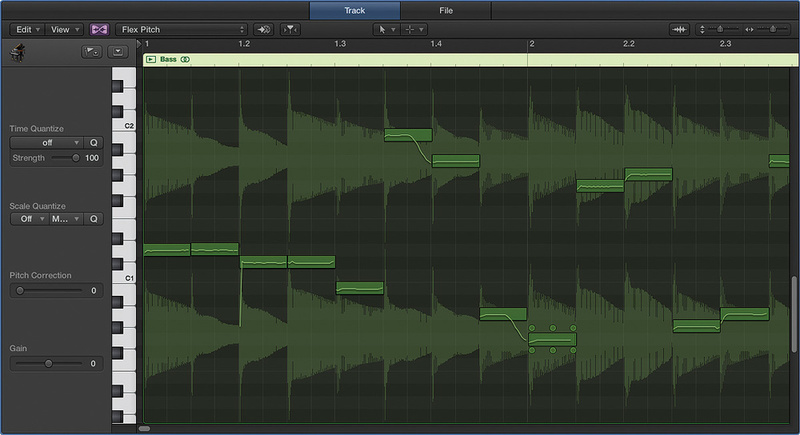 Although I've spoken about audio-based tracks, you can also use Track Stacks with External MIDI tracks. However, for fairly obvious reasons, External MIDI tracks can only be placed into Folder Stacks rather than Summing Stacks. It's also not possible to have sub-Stacks, meaning that you can have Stacks within Stacks. This makes sense with Summing Stacks, but is a slight organisational limitation with Folder Stacks. One of the biggest new features in Logic Pro X is a virtual drummer, who will accompany your music based on various parameters that you can specify and won't charge you union rates. According to Apple, "Drummer is powered by the performances and sounds of some of the industry's top session players and recording engineers,” which included mixer/producer Bob Clearmountain. The basic operation of Drummer is incredibly simple. Once you add the Drummer track to your Project — there can only be one — Logic will automatically create two Drummer regions for you on that track. These regions look like Audio Regions, but they act a little differently. By creating Regions on the Drummer track, you tell your virtual drummer when to play — and, of course, when not to. But the neat thing is that each Region can have a different set of performance parameters, specified in the Drummer Editor that appears in the lower part of the main window. The Drummer editor in the lower part of the main window lets you adjust settings for the currently selected Drummer Region in the Tracks area. There's a nifty vector control to adjust complexity along the Y-axis against loudness along the X-axis, and also an area where you can select what drums in the kit play the main pattern. There are three main instrument elements that can contribute to the pattern: kick and snare, which can be muted and unmuted independently; toms, cymbals or hi-hat; and a percussion element where you can choose between a tambourine, a shaker or a handclap. Alternative patterns are available within each element, and the kick-and-snare element also offers half- and double-time options, as well as a mode that asks the drummer to try to Follow a designated track in your project. You can have any combination of these elements active, though it's important to note that choosing, say, toms as the second element doesn't mean that you won't hear the hi-hat or cymbal; it just means you'll mostly hear them for fills and other embellishments. Speaking of fills, there's a Fill knob that you can use to suggest to the drummer how frequently he might like to perform a fill, and a Swing knob is also provided. If you click the Details button, three further controls become visible to allow you to adjust the feel of the performance (ie. whether the hits push into the beat or pull away from it), how loud any ghost notes should be, and the frequency with which hi-hat is opened or closed during the performance. As you make adjustments in the Drummer Editor, Logic re-renders the drum performance and updates the audio in the Drummer Region. This means that there's a slight lag in hearing the result as you adjust parameters, but it also means that you get the same playback every time. If you want to fine-tune the performance even further, you can convert a Drummer Region to a MIDI Region, making it easy to use Drummer-generated content with any other virtual drum instrument you may have. To the left of the Drummer Editor is an area where you can specify the drummer personality that's selected to perform. Four different styles are provided — Rock, Alternative, Songwriter and R&B — and you get a choice of between two and five different drummers in each style. Each drummer gets a caricature and an often, presumably unintentional, amusing description, such as: "Inspired by hard rock bands and funk pioneers, Jesse plays in-your-face beats on a tight-sounding kit.” I'm sure he does. 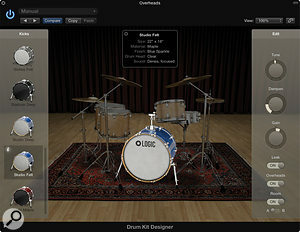 The Drum Kit Designer virtual instrument, with a Producer Kit loaded. The sounds performed by Jesse and the other virtual drummers are powered by a new virtual instrument called Drum Kit Designer, which makes it easy to change the drums, or kit, your drummer is playing. The plug-in's user interface is frankly leviathan and shows a picture of the currently selected drum kit on the kind of dodgy red rug one expects to see in a studio. Clicking on a drum selects it for further sonic tweaking, and on the right are three edit controls where you can adjust the tuning, damping and volume of the drum. You can either adjust the left and right cymbals together or individually. Drum Kit Designer provides 15 drum kits, and when you're tweaking the bass and snare drums you'll also get a choice of alternative drums on the left-hand side. Clicking a handy info button opens a pop-up that gives you the specification of the drum, so you can confirm that the drum you're seeing on screen really does have a Black and Gold Duco finish. Some advanced controls are also available if you click the disclosure triangle at the bottom of the window. Here, you can adjust the volume of the percussion elements in the kit (as well as the sticks, presumably for rim clicks) and also set the input mapping, since it's possible to play Drum Kit Designer as you would any other virtual instrument. The default is GM (General MIDI), but you can also choose a similar GM mode that allows the modulation wheel to control how open the hi-hat is, and a V-Drum mode that enables you to trigger the instrument from one of Roland's electric kits. This latter mode will certainly be welcomed by anyone who's ever had to mess around with V-Drum mapping. By default, Drum Kit Designer routes the audio from the drum kit to a single stereo output, which is only so useful when mixing more serious productions. So, for those who really want to have full control over the drum sound, Apple have also included so-called Producer Kit versions, where each drum in the kit has its own dedicated output. Switching between standard and Producer kits is easy: open the Library with the Drummer track selected and, in the Drum Kit category, you'll notice a folder at the bottom labelled Producer Kits. Now simply select the appropriate kit (notice that the names are prefixed with the plus sign) and you're ready to go. What's really great about the multi-channel kits is that they make use of the Track Stacks feature. And what's useful about this is that the Producer Kits come pre-loaded with the tracks for all the necessary splits, meaning that you don't have to worry about setting this up yourself. Simply open the Stack and you'll see Channel Strips for all the drums with the current mix, where an engineer has already set up initial levels, pans and various EQs and compressors for you. If you open Drum Kit Designer with a Producer Kit loaded, you'll notice there are more alternate drums to choose from, and four additional settings that can be configured for each drum. Leak sets whether the sound of that drum is heard in the mics for other drums in the kit, Overheads sets whether the drum is heard in the overhead microphone, and Room lets you toggle the room emulations, as well as choosing between one of two rooms. 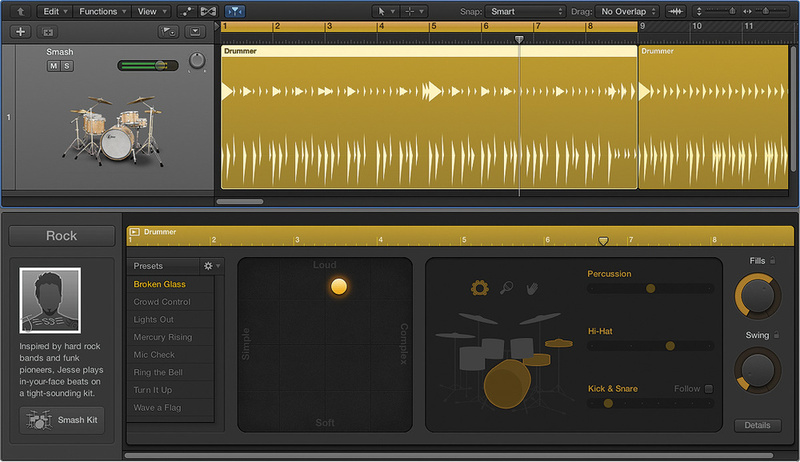 It's clear that Apple have put a tremendous amount of effort into Drummer and Drum Kit Designer, and in terms of integration, ease of use, and the quality of the results, it's quite possibly the best virtual drummer yet. Smart Controls enable you to create a simple interface to control any parameter for any plug-in on a given Channel Strip. Here, I've edited one of the presets by making one of the knobs a Note Length Smart Control that adjusts both the Note Length parameter in the Arpeggiator MIDI plug-in and the cutoff frequency in the ES2 synth, the latter inverted so that the filter opens up as the notes get shorter. One of the things I've always liked about Logic is the way in which Logic's instrument plug-ins tended not to have built-in effects. It made sense to me to have a fairly dry instrument plug-in to generate sounds, and then to use the available insert plug-ins to add the requisite effects. However, this meant that every time you wanted to recall a certain sound, you needed to manually load up all the plug-ins and choose the requisite presets. This problem was solved in Logic Pro 7 by Channel Strip presets, but a second disadvantage remained: you had to open and interrogate multiple plug-in windows to adjust what was, in essence, a single sound. Logic Pro X aims to solve this latter problem with a new feature called Smart Controls, which allow miniature user interfaces to be created that can control any parameter used in any plug-in on a given Channel Strip. This means if you had a Channel Strip featuring, say, a synth sound in EXS24 and a Tape Delay plug-in, you could create a Smart Controls layout that had a knob to control the cutoff frequency in EXS24, and another to adjust the Wet level of the delay. Now, instead of opening two plug-in windows to adjust these parameters, you can do it from a single Smart Controls layout. Every patch in Logic Pro X's Library includes pre-configured Smart Control setups, which you can see by opening the Smart Controls area in the main window or in a dedicated Smart Controls window, and it's easy to adjust these or create your own. By opening the Smart Controls Inspector, you can inspect the mapping for a given Smart Control. You can change the parameter to which the Smart Control is mapped by clicking the mapping entry and selecting another parameter from a hierarchical pop-up menu that shows all plug-ins and parameters available. Alternatively, you can enable the Learn button, open the plug-in, click the parameter you want to control, and then disable the Learn button. A particularly nice touch is that you can set minimum and maximum values for mapping, so the Smart Control doesn't have to control the full range of the parameter, and it's also possible to invert the value, as well as scale it using parameter mapping graphs. Another nice touch is that it's possible for a Smart Control to be mapped to multiple parameters from different plug-ins. Simply click the first mapping entry and choose Add Mapping from the pop-up menu, and another mapping will be added, compete with its own independent settings. This makes for some interesting possibilities, since, in the previous example, you could have a single Smart Control that adjusts EXS24's cutoff frequency and the delay's wetness simultaneously. Smart Controls can also work with Logic Pro X's new MIDI plug-ins (see box), and the Smart Controls area provides an Arpeggiator button that makes it easy to add an Arpeggiator plug-in to the Channel Strip. Once clicked, the Arpeggiator is added and enabled, and a pop-up menu appears next to the button, enabling you to change both Arpeggiator settings and presets from the Smart Controls area. Smart Controls can also be useful when used in conjunction with Summing Stacks, because while each sub-track can have its own Smart Controls layout, so can the main track, with the ability to access all the parameters of all the sub-tracks. Overall, Smart Controls are a great way to add a front end to patches you create in Logic, and possibly the only aspect that I found slightly limiting was being restricted to only work with the layouts provided by the program. For example, some layouts contain switches and some don't, and some layouts contain more controls than you might need, and some too few. Having more user control over the appearance and controls used in a layout would be really helpful. Accompanying the release of Logic Pro X is a new iPad app called Logic Remote, which is freely downloadable from the App Store and allows you to remotely control Logic from any iPad 2 or later running iOS 6. Setting it up is easy: simply make sure both the iPad and Mac are connected to the same network, run Logic, and then run Logic Remote. A list of available Macs running Logic will appear in Logic Remote, and, when you select one, Logic will ask you to confirm the connection. After that, both Logic and Logic Remote will remember this marriage, and re-establish it automatically whenever both sides are available. 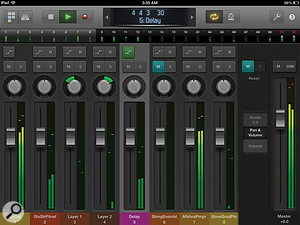 Logic Remote consists of a number of views that allow you to interact with Logic in different ways, drawing heavily on Apple's experience in designing GarageBand for iOS. Always visible at the top of the screen is a miniature Control bar where you'll find various global controls. There's a button that lets you select different views, as well as transport controls, an LCD that shows the current time in beats and the currently selected Track, Cycle and Metronome buttons, and a Settings button. The LCD also has left and right buttons on either side for selecting next and previous tracks in the Track List, and tapping it toggles the display of a ruler. You can use the ruler to scrub time, and if Cycle Mode is active, you can even adjust the Cycle Region. 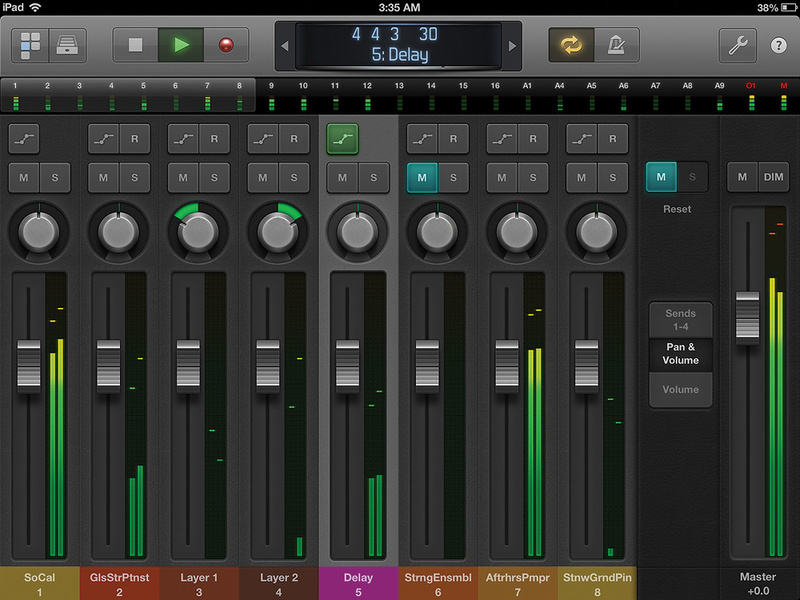 Logic Remote lets you control Logic's mixer from your iPad, and even includes a meter bridge. The Mixer view works pretty much as you might expect. In the upper part of each Channel Strip, there are four buttons for setting the automation mode, record enable (if available for that track), and mute and solo. Below these buttons, there's a choice of what to see: volume and pan controls (which is the default), just the first four send knobs, or simply a volume fader if you want to have a longer fader throw. The Settings button on the Control bar provides access to some useful commands, such as undo and redo, as well as commands for creating new tracks. Say you want to create a new Software Instrument track: you can do you this from Logic Control by tapping New Software Instrument Track from the Settings pop-up. Once you've done that, the new track gets selected and you can tap the Control bar's Library button to access the library of available instrument patches and pick one to assign to that track. Next, you can switch to the Smart Controls view, which shows the same Smart Controls editor as you would see in Logic, as well as a controller to actually play the sound. By default, Logic Remote selects the most appropriate controller for the instrument, so you'll see a keyboard for a piano patch, guitar strings for a guitar patch, and drum pads for a drum patch, although you can override this selection in the Views pop-up if you wish. A related view is the Chord Strips view, which allows you to play the current instrument via the Chord Strips you may know and love from GarageBand. If you have a drum instrument selected, the Drum Pads view will be available instead, showing more pads than are available on the Smart Controls view. 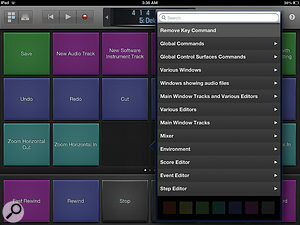 Logic Remote makes it easier to set up and access key commands Logic Remote's Key Commands view makes it possible to trigger key commands from your iPad. Here you can see the configuration pop-out that makes it possible to assign your own key commands and colours., and the Key Commands view provides access to three pages of 18 key commands, plus an additional six that are always visible along the bottom. Tapping in an empty key command opens a pop-up that lets you select a key command from all of those available in Logic. The list is organised into categories in exactly the same way as Logic's Key Commands window, and can also find the key command with a handy search field at the top of the pop-up. To reconfigure an existing key command, change its colour, or remove it, tap with two fingers on the key command to reopen the pop-up. The Key Commands view is great, although it would be even greater if you could see more key commands on a single page. Adding just one extra row, to have 24 plus six commands visible at once, wouldn't make the buttons that much smaller. And wouldn't it be nice if the six key commands along the bottom could be optionally persistent across multiple views, much like the way the Control bar is always visible along the top? The final view provided by Logic Remote is a very simple idea that's also rather clever: Smart Help. Taking the idea of the main window's Quick Help option one step further, if you hover the mouse over a user interface while Logic Remote is connected, Smart Help will open the corresponding section in the manual explaining that particular feature. So, if the mouse is over a Record Enable button, Smart Help will automatically show the 'Enable tracks for recording' section in the manual. And if you want to read something in more detail without Smart Help jumping to another section, the Library button becomes a handy Lock button that can disable the link between Smart Help and Logic. Convenient doesn't even begin to explain it, although it seems a shame you can't look through the Smart Help manual when offline and not connected to Logic. Logic Remote is probably the best remote-control app for Logic, thanks to a level of integration that simply wouldn't be possible with a third-party solution. There's clearly a great deal of potential for where Apple could take this app in the future, but even so, for a 1.0 app that's available at no extra cost, it's hard to complain too much. There is no doubt that Apple have developed some very sophisticated features in Logic Pro X. Drummer, Track Stacks, Flex Pitch, Smart Controls and Logic Remote are, for the most part, brilliantly implemented and serve their purpose well, along with other bonuses such as MIDI plug-ins and being able to have Alternatives within a project. But many of the big new features appeal to very different sets of users. Unless you need a drum kit, Drummer isn't going to be that useful; and while that sounds obvious, the reality is that there are thousands of professional Logic users who will never need a virtual drummer, no matter how good. Such features demonstrate how Apple are trying to broaden Logic Pro's appeal beyond the sort of people who used Logic prior to Apple's acquisition of Emagic 11 years ago. And while that's completely understandable, it means, perhaps inevitably, that certain areas of the program, and certain lingering requests from long-time users, are still arguably not getting the attention they warrant. 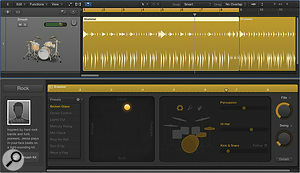 For example, the only real improvements made to the Piano Roll editor in this release have been to bring GarageBand-style editing techniques to the Inspector. Now, there's nothing wrong in having features for quantising pitch to a given scale, it's just that I think most Logic users I know would have preferred to be able to see multiple lanes of MIDI Draw at the same time, or have better surround support. And certainly, if you compare Logic Pro's Piano Roll editor with, say, Cubase's Key Editor, there's an increasing gap in functionality between the two. Furthermore, the measures that Apple have taken to simplify the program mean that certain ways of working with previous versions now seem to be impossible. For example, previously if you had multiple Regions open in the Piano Roll editor, double-clicking a note would move you up a level and display only the notes from the Region to which the clicked note belonged. Now, double-clicking a note opens up the Event List (or the Score Editor if you hold down a modifier) and there seems no way to get back to the old way. I don't want to end on a completely negative note, because there are a great number of advanced features that have been added if you dig around. But perhaps the ultimate problem with Logic being promoted to and used by a broader user base is that there are so many different types of users to serve — and not everyone is a songwriter. If users have to wait so long between updates while observing the movements of competing products, it will always be hard for Apple to meet expectations. Ultimately, though, Logic Pro X is still Logic deep down, has many new features, and is available at a ridiculous price. 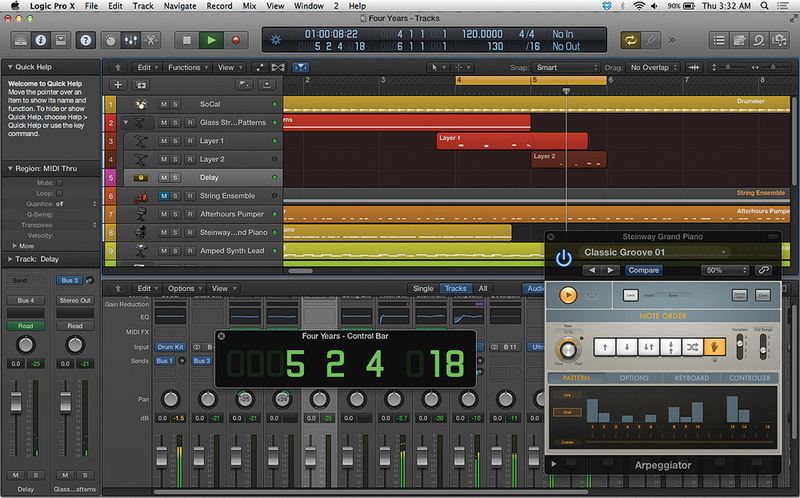 The user interface changes in Logic Pro X see some attention paid to the mixer controls. First of all, you'll notice the volume-fader cap now looks like a more conventional hardware fader cap and no longer displays the current level of the fader, which seems a shame. Instead, the volume is shown in its own display above the fader, next to an easier-to-read peak level display. The Audio Effects slots, formerly known as the insert slots, have also been tweaked a little. If there are no plug-ins in a slot, you'll see an area labelled Audio FX that you can click to add a plug-in. The slot appears much as it did before, with the name of the plug-in, but now when you hover the mouse over a slot, you'll see three controls for bypass, opening the editor, and selecting a new plug-in (or removing it altogether). This is quite nice, since it means you can now bypass a plug-in using just the mouse. Rather than displaying a fully open second slot when the first is in use, there's now just a tiny area visible, which is where you click to add the next plug-in. Alternatively, you can drag the first plug-in into this area, as before, to move it into the second slot. Send slots also get the mouse-hover-bypass control, and Channel Strips now feature a gain-reduction meter, positioned just above the EQ display. This is a nice touch, but it isn't quite as powerful as the one featured in Pro Tools 11: it's not located in such a useful position, and it only works with Logic's own dynamics plug-ins. Flex Pitch makes it possible to edit the pitch of notes in monophonic audio. Notice the hotspots for making more detailed adjustments, the pitch-drift line, and also how pitched notes are ever-so-slightly highlighted, as in the case of the lowest note in the editor. Following on from Logic Pro 9's Flex Time, which allowed you to correct the timing of recorded audio, Logic Pro X introduces Flex Pitch to let you correct (or otherwise adjust) the pitch of recorded audio. It was reported last year that Apple had been granted a patent for 'Polyphonic Note Detection' (US Patent No. 8309834), but the current implementation of Flex Pitch in Logic Pro X only works with monophonic material. To edit the pitch of an Audio Region, you double-click it to open it in the new Audio Track editor. This isn't the new name for the old Sample editor, which is still there and is now known as the Audio File editor, but a new audio editor designed to edit Audio Regions in much the same way you might edit MIDI Regions in the Piano Roll editor. Enable Flex mode on the Audio Track editor's toolbar, choose Flex Pitch from the pop-up menu, and Logic will present that familiar Melodyne-esque display of a piano-roll-style note display superimposed on the audio waveform. You can also edit Flex Pitch information in the main window, which is neat, though I really don't know why you'd want to, as the Audio File editor makes this kind of manipulation so much easier. You can change the pitch and timing of the notes in pretty much the same way as you would in the Piano Roll editor, including being able to split and merge notes. More advanced editing is equally simple, because as you hover over each note in the editor, a number of so-called 'hotspots' appear around the note that you can click and drag to adjust more specific properties. Above the note are three hotspots for dealing with pitch: pitch drift in, if you want to bend into a note; fine pitch, to adjust the note pitch with more granularity than semitones; and pitch drift out, to bend out of the note. What's nice about the handles is that they update the display in the editor as you drag, making it easy to see what you're doing. Below the note are three additional handles for controlling the gain, the amount of vibrato, and the formant shift of the note. Of course, Flex Time isn't necessarily about pitch correction. You might want to copy a Region to add a harmony part, for example, and a nice touch is that the Audio Track editor also implements a MIDI In button. When this is enabled, playing a note on your MIDI keyboard will transpose the note under the playhead to the note that you played and then advance the playhead to the next note. This generally works well, although sometimes I found that the initial note's timing was off just enough for it not to fall under the playhead. Generally speaking, the quality of the results was really good, although I found that sometimes notes were detected in the wrong octave, especially high bass notes. 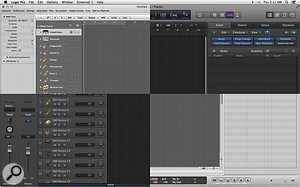 Despite the general lack of improvements to the MIDI editors in Logic Pro X, the score editor hasn't been overlooked. Significantly, the Staff Settings window has been redesigned and, in addition to making the settings much clearer to see and work with, there's a handy preview display of how the currently selected Staff Style will appear. Also, in addition to Linear View (where the score appears in continuous horizontal staves) and Page View, there's a new Wrapped View that's something of a cross between the two, wrapping the score to fill all the available editing area in the score editor. Looped Regions are now visible in the score, with notes that are part of the loop appearing in a fainter grey colour on the stave. Last, but not least, you can now export a score within Logic as a Music XML file. Logic Pro's instrument and effects plug-ins have always been affectionately regarded, even though the cobwebs from the Emagic days have become more apparent in the last few versions. In Logic Pro X, Apple have taken the opportunity to update some of these plug-ins, as well as adding a few new ones (including Drum Kit Designer, which is mentioned in the main text). Sadly, the plug-ins designated for a spring clean might not necessarily be the ones you might hope for: EXS24, for example, seems untouched, at least as far as I could tell. The EVB3 organ emulation has been renamed Vintage B3 and given a brand-new user interface, which is a massive improvement in terms of aesthetics and usability — well, come on, who doesn't like Hammond-inspired skeuomorphism?! The Leslie emulation has also been improved, and, as always, can be used as a stand-alone effect by using the Rotor Cabinet plug-in. Similarly, EVP88 becomes Vintage Electric Piano and EVD6 is now Vintage Clav, and both have refreshed, Logic-Pro-X-style new user interfaces, though they're perhaps not as slick in appearance as Vintage B3's. Logic Pro X also includes a new synth plug-in: Retro Synth is a 16-voice synthesizer offering four different oscillator types: analogue, sync, wavetable and FM. The user interface will reflect your choice of oscillator, so you get a Moog-inspired look for Analog and Sync, PPG for Table and DX7 for FM. But the straightforward structure of the synth remains the same, regardless of the oscillator, making it easy to tweak and program sounds, though I found the analogue and sync oscillators most rewarding. Turning to effects plug-ins, Pedalboard includes seven new stomp boxes — complete with garish designs — like the wonderful Tie Dye Delay (a reverse delay) and Flange Factory, with its Miami Vice-inspired appearance that even includes a pink flamingo. Sound-wise, I quite liked the simpler, warm and dirty Grit distortion pedal. To partner the Amp Designer introduced in Logic 9, Logic Pro X comes with a new plug-in called Bass Amp Designer. With a choice of three amps, six cabinets (plus two direct outs) and three mic models, Bass Amp Designer sounds pretty decent, and Apple have also added inline compression and parametric EQ to help you craft the right bass sound. One feature that will appeal to users who like creative sequencing is the ability to add MIDI plug-ins to Software Instrument tracks. In the early days of Logic, this was the kind of functionality that was handled by the Environment, which included all manner of interesting objects to do arpeggiation, chord memorisation, delays and so on. But while the Environment still works, it hasn't really been a promoted part of Logic for some time, so there was definitely a need for a more modern approach to handling MIDI effects. MIDI plug-ins are added to a Software Instrument track's Channel Strip via a new MIDI Effects slot, in much the same way you add Audio Effects. Well, I say in much the same way, but the MIDI Effects slots don't show the same lip underneath the last slot as Audio Effects slots do. This confused me initially, since I thought it meant you could only have one MIDI plug-in, but it's actually possible to have eight — you just need to click when a green line appears on the bottom of a slot. Also, it's worth noting that while can't use MIDI plug-ins on External MIDI tracks, which is a shame, you can work around this by using the External Instrument plug-in on a Software Instrument track instead. Eight basic MIDI effects are provided, and I'll try to give a brief overview of each one. The factor they all share in common is surprisingly large user interfaces; in theory, you can scale these down within the plug-in editor, but because the text is significantly smaller than the controls, it can become hard to read the labels and displays. Arpeggiator is a surprisingly capable MIDI plug-in, and probably my second favourite in those provided. What makes it really useful is that you can define your own patterns, and there are many good presets supplied to get you started. Used in conjunction with Logic's synths, it's a great deal of fun. Chord Trigger allows you to trigger chords by playing a single note, just like the old Chord Memoriser Environment object. Modifier lets you use an incoming event to modify another type of MIDI message; for example, velocity to scale the mod wheel. Modulator is a modulation source for MIDI events featuring both LFO and envelope generators, although you don't have to use both at the same time. Note Repeater is a MIDI delay effect where you specify the number of repeated notes and the velocity curve they should follow. Randomizer randomises the specified type of incoming MIDI event and allows you to offset the output value. Transposer lets you transpose incoming notes and optionally make them conform to a user- or pre-defined scale. Velocity Processor offers a way to adjust the velocities of incoming note events. You can compress or expand them, limit them, or scale and add or subtract a constant value from them. Best of all, it's also possible to set an overall minimum and maximum velocity range for the processing. Logic Pro X introduces a new Project file format, with the '.logicx' file extension, which is incompatible with the previous '.logic' file format. This means that while Logic Pro X can load songs from previous versions of Logic (back to Logic Pro 5 and Logic Express 5, according to Apple's web site, showing that not everyone has done their homework! ), you can't save a Project from Logic Pro X that's compatible with Logic Pro 9. One of the benefits of the new file format is that more data can be saved within the project file bundle itself. For example, when you save a Project, the assets for that Project can now be saved within the project file bundle so that everything is contained in a single file. (You can also still save a Project as a folder, just like in previous versions.) Additionally, Projects can now contain alternate versions. So if you're the sort of person who saves successive Project files as v1, v2, v3 and so on, you could now save (and recall) these incremental versions as Project Alternatives within a single Project file. You can also later rename and remove older versions via the new Edit Alternative window. Another improvement is that Logic Pro X now has a proper auto-save implementation that works in the background, so you don't have to worry about losing information if something bad happens and you've forgetten to save. I only had one crash after updating to 10.0.1 (10.0 had a few stability issues), and Logic prompted me immediately upon restarting to ask if I wanted to use the auto-save version or my last saved version. Fortunately, auto-save seemed to have kicked in right before the crash, and nothing was lost. 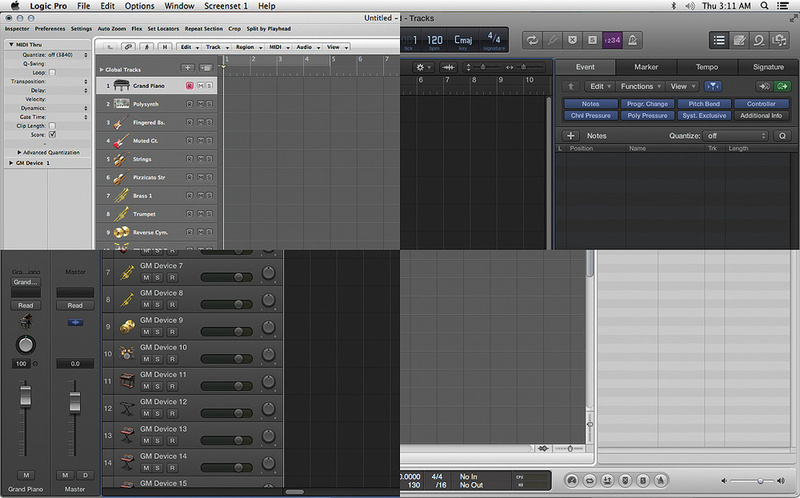 This is obviously a big improvement upon Logic Pro 9. New user interface makes Logic easier to use than ever before. 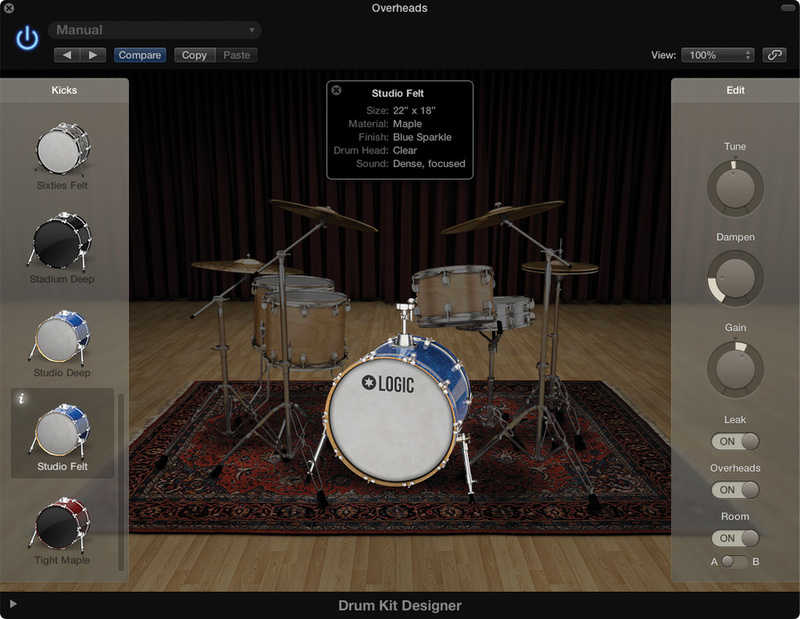 Drummer is the best integrated virtual drummer yet seen. Track Stacks help to organise the Track List and also add creative possibilities. Includes MIDI plug-ins, with the facility to script your own. 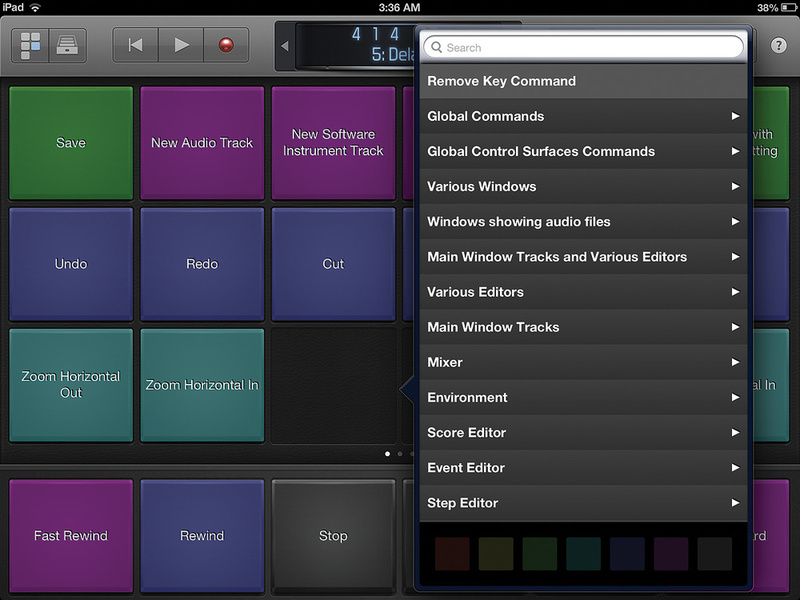 Logic Remote is the best way to control Logic Pro X from an iPad. Existing users might not appreciate every change in the new interface. Not all users will agree with the direction Apple are taking with Logic, and some of its more traditional sequencing functionality feels neglected. Logic Pro X introduces a new interface and a large number of powerful, inventive, and musical features, but not all existing users will feel their needs have been met with this release. RME Fireface 800 audio interface.